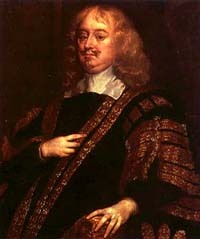 Edward Hyde was appointed Chancellor to Charles II in 1658 while the exiled court was still in Bruges. Following the restoration of the monarchy he was created Baron Hyde of Hindon, Viscount Cornbury and then Earl of Clarendon and Chancellor of Oxford University. At Oxford he lent his name to a building, a printing press and a typeface still popular to day. Clarendon stayed, at first, at Worcester House in The Strand and it was from there that his daughter Anne was secretly married to James, Duke of York, Charles's younger brother. In 1661 he was presented with Cornbury Park, north west of Oxford but although convenient for Oxford he probably needed a property nearer to Hampton Court Palace, now re-occupied by the King. His son, Henry took the title Lord Cornbury and, in 1661, became the titular owner of York House, Twickenham, with £3,500 provided by Clarendon. Aged 23 Henry had just married and was working for his father. It was a family arrangement because Clarendon both paid the Hearth Tax in 1664 and 1666 and owned the pews in St Mary's Church, which came with the property. He also exerted influence over the Vestry in the appointment of churchwardens, and paid the rates. In 1661 York House was a comparatively new building, no more than 25 years old, and had been occupied by the Earl of Manchester for about five years. 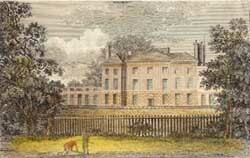 It was the largest house in the parish. It is not clear how much time Clarendon actually spent here. He had started building work at Cornbury Park in 1663 and, from 1664, a substantial mansion in Piccadilly, Clarendon (sometimes known as Dunkirk) House. In 1666 he wrote a will, leaving York House to his second son Laurence, later the Earl of Rochester (of the 2nd creation). By 1667 Clarendon had fallen out of favout. In June he was deprived of the Great Seal and, threatened with impeachment, went into exile. He died at Rouen in 1774. The Great Seal was passed to Sir Orlando Bridgeman (c1606-1674), who was himself dismissed in 1672 for refusing to sign the Declaration of Indulgence and retired to Teddington.